Ten Speed Press, 9781607747468, 240pp. SAMANTHA SENEVIRATNE was a food editor at Good Housekeeping, Fine Cooking, and Martha Stewart’s Everyday Food before starting her blog Love, Cake, which was a 2015 finalist for the Saveur Blog Awards. She is also a recipe developer, food stylist, and the author of The New Sugar and Spice and Gluten-Free for Good. She lives in New York City. "Samantha Seneviratne has a fresh approach to what can feel like a tired niche — the baking book. She organizes her beautifully photographed cookbook by spice, so chapters are sorted by cinnamon, nutmeg, vanilla and so on. It's a different way to peruse — and be inspired by — a baking book. And tucked inside those chapters are approachable and creative takes on classic treats. " "This is a gorgeously imagined and photographed book with a warm-hearted spirit. Seneviratne’s instructions are welcoming and informative. She offers well researched spice intel and clear baking cues." 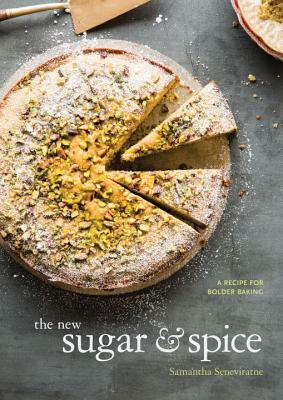 "With beautiful, understated photos, a history of each spice's production and use over the centuries, and lovely stories about Sri Lanka and Seneviratne's grandparents, The New Sugar and Spice is a baker's dream come true."